The Gisborne & Mount Macedon Districts Historical Society�s collection covers the localities of Cabbage Tree; Couangalt; South Gisborne; Gisborne; New Gisborne; Bullengarook; Macedon; Mount Macedon; Barringo; Cherokee; Hesket; Kerrie; & Riddells Creek. A dedicated group of volunteer members of the Historical Society meet regulary to assist with the accessioning, conservation, filing and indexing of the collection, to assist visitors to the Court House and to attend to research enquiries received by phone, mail or email. A research fee of $25.00 per surname or topic applies. The beautifully restored, 1858 Gisborne Court House, home of Gisborne and Mount Macedon Districts Historical Society is open to the public each Wednesday from 10am to 4pm, when volunteers are in attendance to assist with family and local history research enquiries. The Family and Local History Resource Centre at the Court House may be opened at other times by appointment. To foster and encourage the collection, conservation and study of local and family history. To share information from the collection with students, historians and researchers. To acquire and preserve all such objects and documents as may be considered by the Society, to have relevance to local heritage. To promote interchange of information among members and local residents, by participating in excursions, lectures, discussions and exhibitions. To publish books, newsletters, brochures and articles in local community newspapers containing information relating to the heritage of this district. 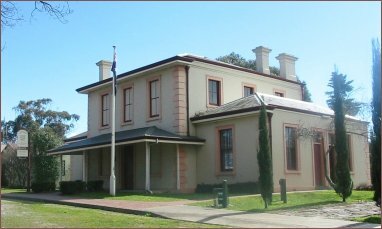 In 1995, Gisborne and Mount Macedon Districts Historical Society invited all Heritage, Historical and Genealogical groups within the Macedon Ranges Shire to meet with the intention of forming a Heritage Council to liaise as a single body with Shire Administration and be a forum for the exchange of ideas. The first meeting in Woodend was attended by representatives of Gisborne Genealogical Group, Kyneton Historical Society, Friend of Kyneton Museum, Malmsbury Historical Society, Romsey & Lancefield Historical Society, Woodend Heritage Society and Gisborne & Mount Macedon Districts Historical Society. Chaired by the Chairman of the State Council of the Royal Historical Society of Victoria it was agreed that the aim of the Macedon Ranges Heritage Council was to be a representative body, whilst still retaining the individuality of representative groups within the Macedon Ranges Shire. The objectives were to foster communication between the Historical Societies, to provide an avenue for the sharing of ideas and expertise and to provide a focal point for the Macedon Ranges Shire Council. Following preliminary discussions with the Macedon Ranges Shire Council, it was agreed that the Heritage Council would begin regular meetings to be attended by the Shire�s Heritage Adviser and a delegated Councillor, with a view to discussions on heritage matters within the Macedon Ranges. In more recent times the Gisborne Genealogical Group and the Macedon Ranges Branch of the National Trust Victoria have withdrawn from Macedon Ranges Heritage Council. The Heritage Council continues to meet four or five times per year with each member Society hosting a meeting on a rotating basis. HAVE YOU BEEN TO GAOL RECENTLY? Visitors to Gisborne are surprised to find that Gisborne�s original 1858 Lockup, situated at the rear of Gisborne Court House is still as solid as it has been for over 150 years. If you visit there today, you will find an automated sound & light diorama featuring stories adapted from Court records. Free of charge, this display is open daily from 10am � 2pm. The Lockup is part of a heritage complex including the original Stable, currently being restored and soon to open as a static Heritage Museum open daily, the Quiet Corner, Privy and the Court House, home of the extensive resources of the Gisborne and Mount Macedon Districts Historical Society.